MaPaw had to say goodbye to a true friend last weekend. Chena’s mom, Rita, passed away after suffering a stroke. 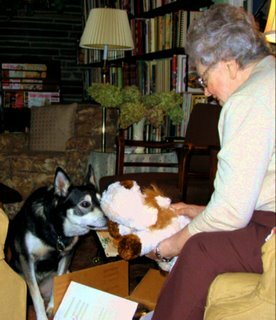 Rita loved Siberian Huskies her whole life and adopted three rescue dogs. Before adopting Chena, Rita adopted two seniors who she loved for the rest of their lives. Though Chena was only five-years-old, she was so gentle and quiet, we thought she might be a good match. When we took Chena to meet Rita at her home, Rita shared stories of her beloved Penny, her previous rescued Sibe. Rita lived alone and loved having a fuzzy companion to listen to her talk and follow her from room to room. Chena sniffed around the house and explored the yard, then our skittish, little girl settled down in a beam of sunlight that hit the floor next to Rita’s chair. Chena came from an abusive owner in Alaska who planned to shoot her for not earning her keep as a sled dog. Chena was terrified of new situations and especially frightened of men. She had frequent accidents in her foster home related to her severe separation anxiety. While her foster dad focused on teaching her that he was a good person who would not hurt her, her foster mom tried to teach her to sit on command. While most dogs sit fairly reliably after two or three days of training, Chena took several months before she had a single success. She was just too nervous to focus. Rita took a biscuit from one of the many cookie jars in her home and asked Chena to sit. Without hesitation Chena sat. Chena spent her days greeting the people who came by to help Rita with her daily activities and her nights sleeping in Rita’s bed. Rita even called to say how much she enjoyed watching Chena chase birds and squirrels in the yard, since her previous dogs had been too old for such vigorous activity. When Rita fell, she didn’t go to the hospital right away because she didn’t want to leave Chena, but after two days, she realized she had to go and called MaPaw for assistance. Of course we agreed to take care of Chena until she could return home, but sadly that will never happen. Although Chena had a home for only a few months, she became a less fearful dog in that time, transformed by the patient, unreserved love Rita gave her. Rita did make arrangements for Chena in her will, and we are waiting to find out where Chena’s tumultous life will lead. Please do not forget your animals in your will. If they ever need to face the grief and stress of losing a loved one, you want to know they will be in a loving home.